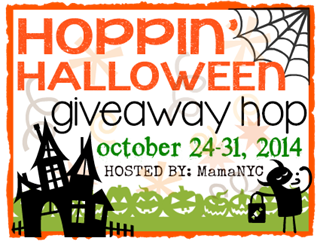 Hoppin' Halloween: $50 Paypal Giveaway! Thanks to Mama NYC for hosting this awesome hop! It's time to treat my readers! I know you all love my blog already, right? Well, you will really, really love my blog now. You can enter to win a $50 Paypal gift card just for being a reader. Disclaimer: This contest will run through October 31st at 11:59pm EST. Must be 18 years or older to win. This promotion is in no way sponsored, endorsed or administered by, or associated with, Facebook, Twitter,etc. You understand that you are providing your information to Lauren Paints | a beautiful life and not to Facebook, I will not use your information other than to e-mail you a winning notification if you are the chosen winner. Enter using the Giveaway Tools form above. Void Where Prohibited. Please note that Lauren Paints | a beautiful life is not responsible for sponsors that do not fulfill their prizes.